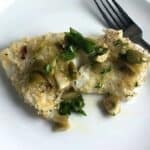 Easy baked cod recipe is delicious topped with an olive lemon relish! Even better with a nice Albariño from Paso Robles. Combine the dry ingredients in a medium to large bowl–panko breadcrumbs, Parmesan cheese, garlic powder, basil and salt. Pour the 2 tablespoons olive oil into a separate medium to large bowl. Take one piece of the cod fillet, dip both sides in the olive oil and let the excess oil drip off. Dredge the cod in the dried ingredient coating, both sides, and place on a baking tray lined with aluminum foil. Repeat with the remaining pieces of cod. Place the cod in the oven, and bake for about 20 minutes. As the cod bakes, make the olive relish. Combine the olives, 1.5 tablespoons olive oil, lemon juice and vinegar in a small bowl. Set aside. Check the cod for for doneness at 20 minutes– the cod should be cooked through, white flesh and flake easily. Some pieces might need a bit more time than others. If so, removed the cooked pieces to a platter and let the other pieces cook for a few more minutes. Don’t overcook the fish! Plate the cod, and serve topped with the olive relish. Enjoy! After the cod has been rinsed and patted dry, place it on a cutting board and cut into 3 roughly equal sized pieces. If some pieces are thicker than others, pound the thicker ones to get the pieces to be relatively equal size. A good size cod fillet of 1 pound or more will likely have some parts that are pretty thick, and some thinner parts. Cutting the fillet into a few pieces helps ensure it all gets cooked right, cooked through but not overcooked! Pounding the thicker pieces to make them all similar size helps with even cooking. I didn’t use mustard in making the cod, but have done so cooking haddock with a similar preparation. So if feel free to use a bit of mustard here if you like that flavor.